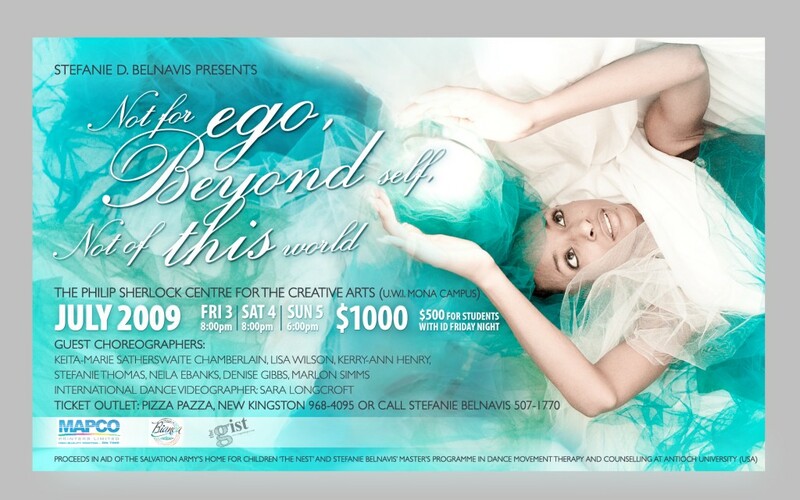 Stefanie Belnavis presents ‘NOT FOR EGO, BEYOND SELF, NOT OF THIS WORLD’, a benefit dance performance in aid of the Salvation Army’s Home for Children, “The Nest” and Stefanie’s Master’s programme in Dance Movement Therapy at Antioch University. Stefanie’s goal is to become a Certified Dance Movement Therapist with the American Dance Therapy Association (A.D.T.A). Stefanie currently volunteers with the Salvation Army as a Dance Instructor and would like to aid them in purchasing an industrial generator for their home. NOT OF THIS WORLD speaks to the hope of introducing the concept of Dance Movement Therapy to Jamaica and the Caribbean. Along with choreography from Stefanie, the show will also feature works from a series of emerging Jamaican dancers and choreographers, including Denise Gibbs, Keita-Marie Satherswaite Chamberlain, Kerry-Ann Henry, Lisa Wilson, Marlon Simms, Neila Ebanks, Stefanie Thomas and International Dance Videographer, Sara Longcroft. Tickets are available at Pizza Pazza, New Kingston (968-4095) or from Stefanie Belnavis (507-1770). Go Stephanie! Well done for all your work, all the best. Stef, I am so proud of you and am happy to be associated with the show. All the best and good luck. See you on Sunday.